This copper coated acrylic wrist strap is adjustable and comes with a 4mm medical snap. 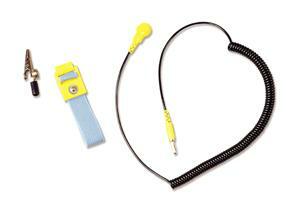 Available alone or with 6', 10', and 15' coil cords.The color is a blue band with a yellow buckle. Other colors available upon request. Contact us for special requests. The coil cords below are a 1/8" (4mm) female snap to Banana w/Alligator Clip. Note: The snaps on the wrist straps are also compatible with cords made by other major manufacturers.